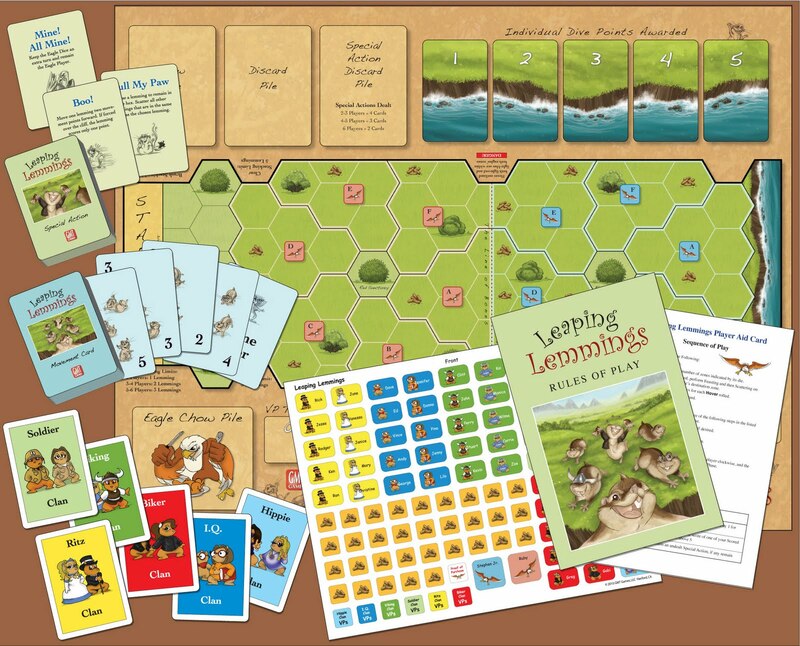 Leaping Lemmings is a quite simple game, with the rather unusual target of hurling a clan of lemmings most stylish over a cliff. Sounds interesting? It's definitely a lot of fun! GMT Games steadily improved the production quality of its games, with this one being one of the best so far. The box comes with a nice mounted board, sturdy cards and cute counters. Also two eagle dice (red and blue) are included, as well as the rulebook of course. Each player chooses a Lemmings Clan (consisting of 10 single Lemmings) and uses movement cards to manoeuvre them across the map. There are two dangerous "Eagle Zones" which have to be passed, without being eaten by the eagles. The eagles are controlled alternating by the players, which is an interesting mechanism. After having reached the cliff (maybe with the help of special actions) the lemmings score Victory Points for their dive. The player with the most VPs wins the game. I was not sure whether I might like Leaping Lemmings, but I have to admit that it is a truly fine game! Despite the rather short playing time, a lot of strategy and tactics are part of the game, as well as interesting game mechanics have been developed. Last, but not least, the theme is outstanding and adds to the impressive overall experience! Can be recommended for a broad audience, as a lot of different aspects are covered. 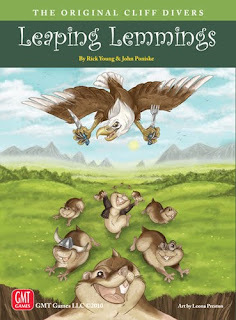 From the publisher: Leaping Lemmings is a humorous hobby or family game for 2-6 players. Each player controls a cloned clan of lemmings that have been specially trained to compete with the other lemming clans, all trying to scurry down a canyon and hurl themselves over a cliff. Distance and style points are important. One lemming diving with style and élan is worth as many as five of the more mundane divers. But beware the hungry eagles circling overhead or your lemmings might not even make the cliff edge!